TOKYO – Having lived in what many consider to be one of the more expensive cities in the world, I often get asked where one can get decently priced food and drink in Tokyo and my answer is always the same, “just to go to any izakaya.” Conceived to provide sake drinkers with a place where they could also order food, the izakaya (pronounced IS-AH-KAI-YA) is essentially a casual Japanese eatery, known for an extensive and always super fun assortment of alcoholic drinks and small-food-plates. Why go? Izakayas are loud, fun, inexpensive and a must for any traveler to Tokyo interested in experiencing Japan’s version of a gastropub (ok, maybe not as high-end but definitely a step up from pub grub). Vibe is totally relaxed and casual – diners can order, drink and eat at their leisure; in fact, it’s encouraged. Izakayas are great for a night out with friends or an after work thing with colleagues and, with the huge variety of food and drink they offer, there’s always something for everyone. And most importantly, it’s just fun to press the call button – yes, most izakayas equip their tables with a handy call button so ordering is easy with no more awkward wait-staff interruptions. What to eat? Stick with traditional izakaya-style dishes: sashimi (paired with sake) and tofu salad (for the more health conscious); fried options like chicken karage and potato croquettes (paired with beer); yakitori or skewered and grilled meats/veggies (also paired with beer); the random pizza or pasta (localized for Japan tastes sometimes with squid ink); and a variety of desserts including parfaits (often with green tea or sesame ice cream) and my personal fave, the infamous yet so-good, koh-hee jelly (coffee jell-o with a sweet crème topping). 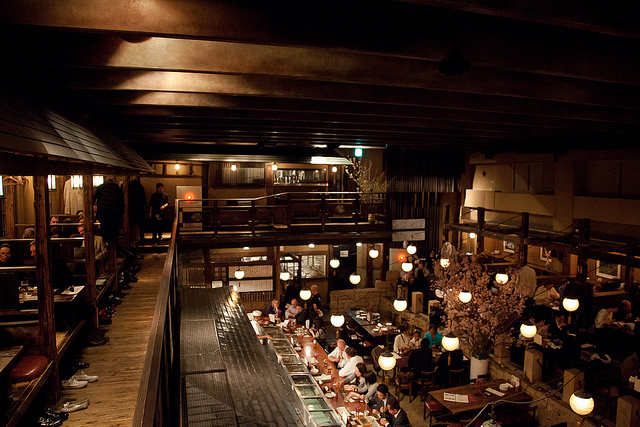 Each izakaya usually offers a few of their own specialty dishes that are always worth a try, so look for those as well. What to drink? Japanese beer is always a must. Do as the locals and start with an ice cold one (ask for a “nama biru” which means draft beer) and revel in how right that first sip – or gulp – feels, especially if it’s after a long day of work or sightseeing. After that, consider making your way through the drink list….sake, shochu (always mugi, not imo) or cocktails. The grapefruit sour is always worth a try as well – fresh squeezed grapefruit juice, shochu and club soda over ice. Alcohol can be had by the glass or bottle (for groups) and they also offer free bottle keep service if you’re unable to finish.